FGNN: Dog Invasion Continues! Item Codes! It's the Furvilla Global News Network (FGNN), coming straight to your town from its headquarters in Tigereye Peak! This is Anchorman Frostbite bringing you all the finest news from around the Furvilla globe. Today, we've been getting reports from Dragonsmaw Manor that the dog invasion continues! So many dogs! So much bork! In other news, a great many of you villagers from all around the globe have been writing in for item codes! It seems that your requests have not gone unheard! 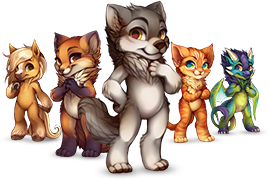 FGNN is happy to report that item codes have been reported as going out with packages from the Furvilla Store! Our information shows these plush come from item codes sent out with the equivalent item in the store. But that's not all! It appears that brand new village home Wall Art has appeared! Why hang that print on one wall when you can hang it on two? A Wall Art item has been reported as coming with every print obtained from the store. We've also heard that some of you out there listening were responsible for this neat idea! Oh god this is a horrible idea. Who the heck thought that unbreedable shop mini pets was a good idea? You can't even pick which rarity color you get when you buy from the shop. making them unbreedable like this is just a cash grab since you HAVE to keep buying them now instead of being able to breed for the rarer colors. cute but I'll never have any of them lmao. This is probably a stupid question, but how do we get these little guys?